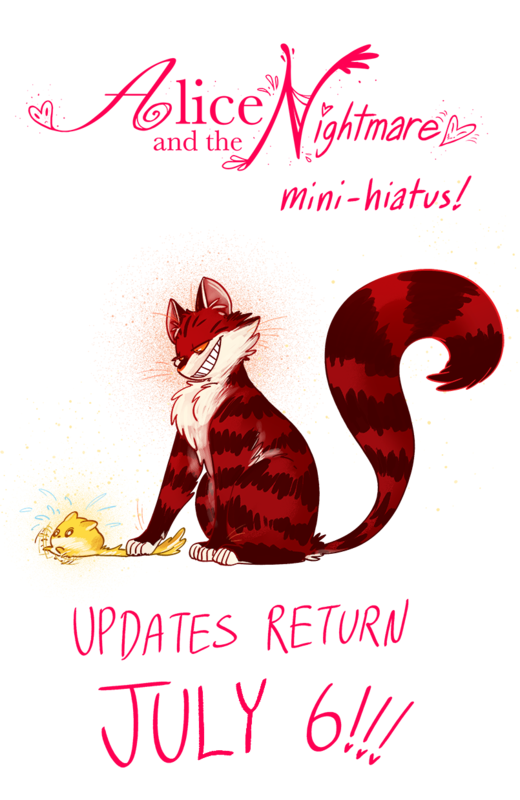 Alice and the Nightmare - Mini Hiatus! Hey folks! There's a lot going on between freelance deadlines, I'm going to be on vacation for a good part of June, and I'd love to built at least a bit of a buffer so I'm not scrambling to get pages up twice a week, so I'm taking a short break! Thanks for your patience!! If you enjoy this comic and want to support it, consider giving Patreon and Ko-fi a look! Thanks so much!! See you guys soon! EDIT!!!! So in lieu of personal reasons (gonna be away from my desk for 2 weeks, burnout is strong, and visiting family for wedding preparations) AatN's return date has been moved to July 6! Sorry and thank you for your patience!! Hopefully after this month things will calm down, June is really buckwild right now and I dont want pages to suffer because of it! Thank you! !